"Architecture, like the shaft of an axe, must beautifully and precisely symbolise its own good reasons for its necessary existence. Insight and sincerity will tell us which reasons are good." 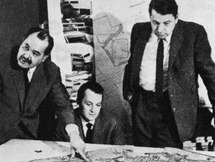 Ralph Erskine (February 24th 1914 – March 16th 2005) was a British architect and urban planner who lived most of his life in Sweden. 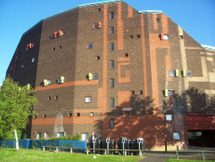 Erskine spent his childhood in Mill Hill in the London Borough of Barnet (North London). During the 1930s, he studied architecture at the Regent Street Polytechnic, London. One of his fellow students was Gordon Cullen who would become a well-known architectural illustrator, urban designer and theorist. Cullen advocated the improvement of urban settlements through an understanding and analysis of their picturesque qualities. This approach was profoundly influential on Erskine, who insisted in his work that the context and landscaping of his buildings be carefully integrated. After qualifying as an architect Erskine began work with the design team for Welwyn Garden City under the leadership of Louis de Soissons. He studied town planning and this interest broadened his approach to architecture, in particular about how buildings related physically and socially to their setting. Before the outbreak of World War II, Erskine traveled to Sweden where settled down and opened his own practice. He was attracted ot Sweden partly by his admiration for the work of the Functionalist Swedish architects Gunnar Asplund, Sven Markelius and Sigurd Lewerentz and partly by the country's adoption of the social welfare model. In Sweden, the political will was reflected in the national architecture and these two factors coincided with his own humanist beliefs. Erskine often experimented with designs that depend on user participation and environmental compatibility. These were also the topics that he brought to discussions of the Team 10 movement of which he was a participating member. However, Erskine was always a relative outsider to the Team 10 discourse. In his pragmatic view the Team 10 meetings were too theoretical. In 2000, he invited his long-time collaborator Johannes Tovatt into a partnership, naming the company Erskine Tovatt Arkitekter AB. It was Erskine's will that on his death his name be removed from the company. Therefore his legacy lives on in Tovatt Architects and Planners in Drottningholm outside Stockholm.